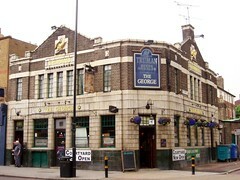 Pub on Tower Bridge Road in Bermondsey, towards the Bricklayers Arms roundabout. The frontage still has some nice Truman's bits and pieces, including interesting glasswork, and part of the seating inside is repurposed church pews, which is quite fun photo. secretlondon visited one Thursday evening in January 2009. They do doubles and a mixer for £2.30, and had two draught ciders and one bitter (Courage?). Kake and bob visited on a Sunday evening in April 2011. They again only had one real ale on, Courage Best. A pint of this and a half of Strongbow came to £4.30. A notice on a blackboard advertised toasties for £2. Football with the sound on was playing on a large flatscreen over the door, but mostly drowned out by very loud music, which seemed incongruous given that there were only one or two other customers in. They have The Cloud wifi. They also do food but not sure when. secretlondon's verdict: A friendly locals' pub. Last visited by Kake and bob, April 2011. Last edited 2011-04-09 17:37:44 (version 5; diff). List all versions. Page last edited 2011-04-09 17:37:44 (version 5).